Without being too dramatic this is a true statement. Management-Intensive Grazing without question is a lifesaver, and in our case it was the answer to problems that at the time we believed to be bigger than all of us. Our outfit was 100% family operated. There were no hired hands. Donnie our son and I did all of the milking plus all of the fieldwork and Betty, my wife and Donnie’s mother, was the relief milker and the provider of lunches when it became impossible for us to get to the house. We felt that we were on the right track to really build a successful operation. When the first dairy buy-out came along, we thought that we were doing everything the right way and were convinced that it was time to expand. So we bought out a man that was selling out, growing the number of cows we milked up from 75 or so to 125 in one day. This experience is a story for another time. But for now just take my word, it is something that I don’t intend to ever repeat. This dairy was a dream reached and we really believed that this was what we were going to do for the duration of whatever life was left to us. But it was not to be, because, keeping this a family friendly piece, stuff happens. We had built this outfit on rented and leased land just down the road from our place. The cattle and milking equipment and all of the farming equipment was ours but we didn’t own any of the land. After all these years landlord trouble began to show up and the longer it went the worse it became. I think hindsight being 20-20 it was decided that we were in the way of land development and untold riches for the landowner. 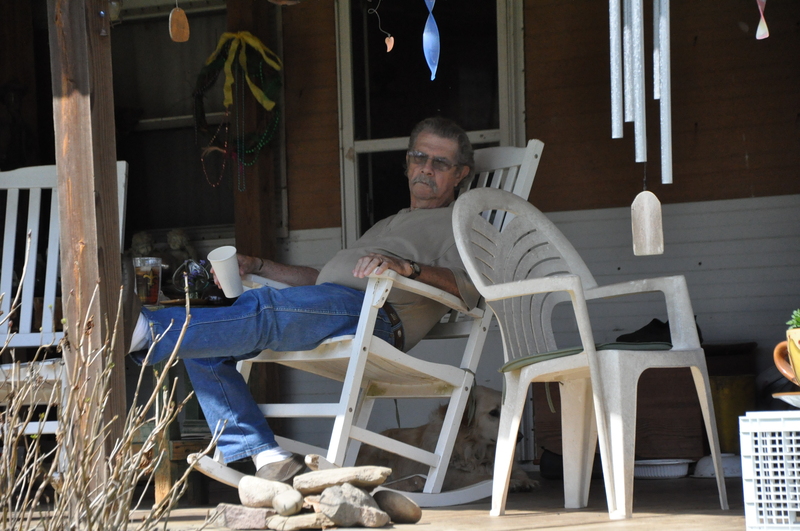 Don on the front porch. 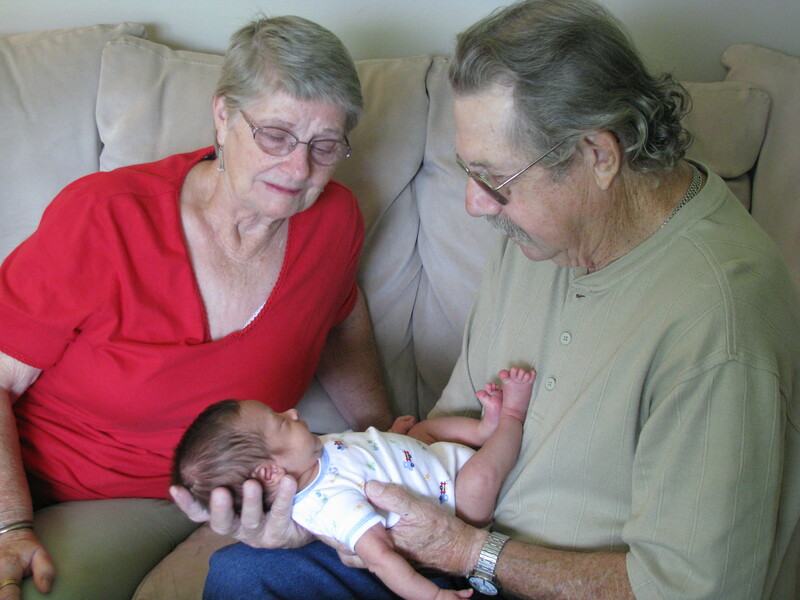 Then in 1990 Betty was diagnosed with breast cancer and had to have a mastectomy and then endure a round of chemo. About then our insurance company informed us that they were declaring bankruptcy and this meant that we were responsible for all the costs of Betty’s operation and treatment. Needless to say things were close to more than we could handle for a while. It is said that we are not given more than we can handle, but I believe that this may have been all I can handle. There is a whole year that as far as I am concerned is almost a complete blank. But then I think about it and I remember more than I really want to. But maybe I’m making too much of this. After all there are folks who have had to endure with much, much more. I don’t mean for this to turn into a pity party. We had known for more than a year or more that the day was coming that we would leave this place. The farm economy had been a flux for several years and the lending agencies were not interested in loaning money for the purchasing of a farm. Naturally Donnie was very upset, he had bought the first herd when he was 19 years old and now had a wife and 3 daughters to support. And by this time the landlord situation had become to the point that it was going to get very ugly. With Betty’s sickness on top of everything else, we knew it was time to go. It was just time to go. We came out better than most. We were able to pay all of our debts and had a few dollars left. It is very sad to remember all of this and harder still to write about but it happened and I am not going to say we are the better for it, but it is what it is and we have all gone on with our lives. Which brings us to today, Donnie is the barn manager of a sale barn in Baton Rouge, Betty is going on 25 years being cancer free and I’m just hanging around doing wherever it is old guys do. I’m just joking about just hanging around and this is the part of the story that explains why MIG is a lifesaver as it may have saved mine. After we sold the milk cows Donnie went to work running an outfit for a man raising registered Gelbvieh cattle and Betty went to work cleaning houses and after a few years had her own cleaning business. I went back to working as a pipefitter on construction projects. I was not in a good place. I could not get over the thought that I had failed. I still believed that there should have been something that I could have done to make it all right, after all I was the husband and daddy and it was my job. Then it happened. Donnie had gone to a workshop at University of Louisiana, Lafayette about Management-Intensive Grazing and he brought all of the literature in one evening and said that I might be interested in looking at it. I looked at it and declared this is all foolishness. But then I began to look a little closer and it all started to make sense, and from that day until today I am a believer and have used it since 1997. In 1968 my brother, Dickie had bought a place that I had found close to where our Daddy and Mother lived. 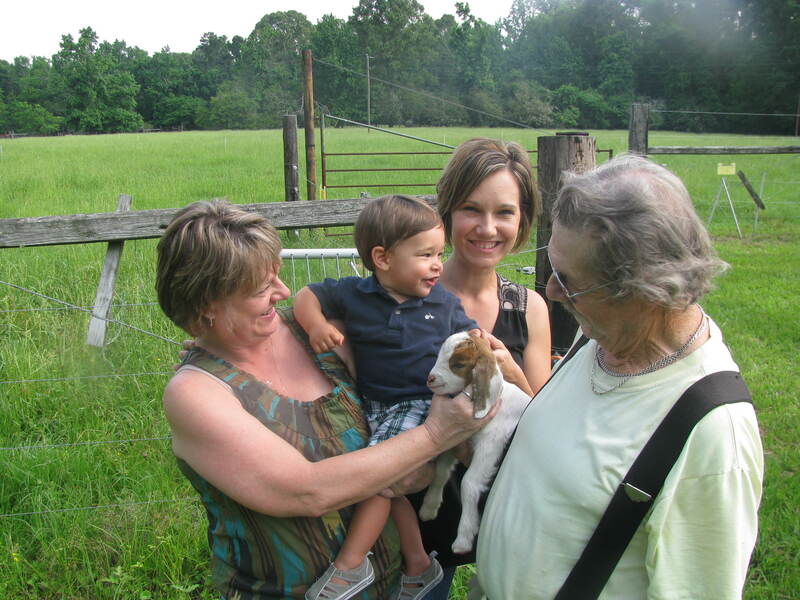 This place consists of 54 acres which is about half in woods and half in pasture. Another story for another time, but we had moved on this place while we were in the dairy business and live on it now. This is where we begin to develop our MIG operation. While we never expected this little outfit to make our living it has made us more money per acre than we ever thought possible. And this has led us into helping small acreage owners create grazing systems that will enable them to make a profit on their places. 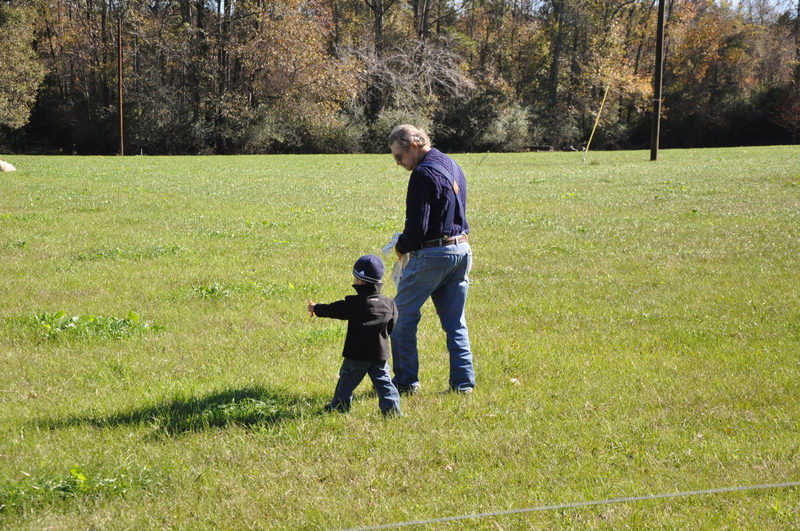 Don showing his pasture to a future farmer. Jim Gerrish says that MIG is a goal driven approach to grassland management and utilization, but to me it is much more than that. It has been the tool we have used to do things on this little 54-acre place that would be impossible without it. But more than that it gave me reason to believe again. All it takes is a success or two to make the bad better and make it easy to smile again. MIG did this for us. Hey! Wouldn’t you like to get the weekly email telling you what articles are up? Click on the button below and you’ll be on your way! Grazing: Is it Art or Is It Science? I am just starting to put together my intensive grazing pasture. I am going to put up wire with divisions every 3/4 acre (20+ acres). I’m so excited to try this and see how it works! Could you please recommend articles I need to read?